It may not be very fashionable to be a ‘good European’ at the moment but Burnley is certainly playing its part in Europe. The Council of Europe, a body of 47 nation states (not to be confused with the European Union), has awarded Burnley ‘le Diplôme européen’. The award has been made for its work in improving relationships between the people of Burnley and other European countries, in particular the people of its twin town, Vitry-sur-Seine, close to Paris. Indeed it was the only town in the UK to receive the award. Only 12 were offered to towns from 47 countries across Europe. It was great too, to see that a part of the application was arts based, and related to Mid Pennine Arts! It was possible to go back and highlight Nick Hunt’s well received presentation on the Singing Ringing Tree and the Panopticons to a huge cross-section of arts organisations from across Europe, South America and the United States at the opening of a new gallery for contemporary art from the whole of France, the Mac Val, in the Val de Marne department of northern France. 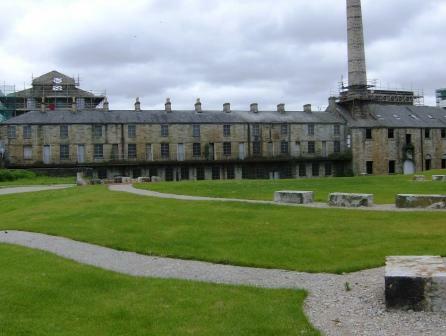 Mention was made of a visit by arts workers in Spain to Burnley’s Youth Theatre. The visit, organised by Arts Council England, offered presentations (from Nick for MPA and from Curious Minds) on Burnley’s commitment to public art, arts in the community and arts education in schools. Of course the bid covered the work of Burnley’s Twinning Association: organising ramblers visits to and from France, 20 weeks of French lessons for its members, and welcoming 31 guests from Vitry into the homes of local people in April this year. The Council too, has also contributed in hosting study visits over the last five years from groups of social workers, voluntary associations and students from Germany, France, and Norway. At the same time officers from the Council have actively participated in conferences and award ceremonies in Berlin, Slovenia, Gerona, Bilbao and Vilnius in Lithuania..
…and there is a huge amount going on in our schools! 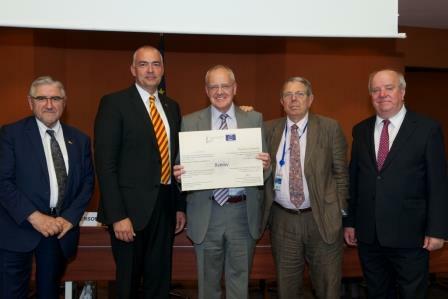 Well; the European Diploma was collected on behalf of Burnley Council at the Council of Europe in Strasbourg by an honorary MPA staff member… David Smith! MPA’s Creative Learning Programme Manager, Dr Steph Hawke, is one of three creative collaborators working on Burnley Borough Council’s project ground-UP along with Cath Ford and Iain Broadley. The three of them joined a group from Lancashire visiting Anfield Home Tour, part of the Liverpool Biennial programme. Here’s Steph’s blog about the day. Is it really possible to know a place if you have never lived in it? Existential philosophers have expressed an interest in sense of place as ‘lived experience’. They wanted to get to the very essence of place through a study they called phenomenology. On Wednesday 5 December 2012, Cath, Iain and I hopped on a minibus in Liverpool and came screeching, slap-bang, face to face with a tale of lived experience so heartbreakingly poignant and electrifyingly angering that we were able to think of little else that week. We didn’t live in that place, but through an incredible artistic intervention we certainly experienced its phenomenology. This was the Anfield Home Tour. Originally commissioned as part of Liverpool Biennial, the tour is a careful weaving of personal experience, literary talent, comedic improvisation and theatrical direction that combine to tell a story, or many stories, of life in an area of housing market renewal. The tour reveals tension between insider and outsider accounts of Anfield’s situation; the resulting ‘insider’ narrative is so rich in colour and texture that lived experience in Anfield is brought into sharp focus. Housing Market Renewal arrived in Anfield some fifteen years ago. As ‘Carl’ our tour guide pointed out – the emphasis here is upon housing market renewal, not community renewal. In his view, this has been a project entirely focussed on the future with little regard to the ‘now’. The gleaming Keepmoat future has yet to arrive for many who continue to live in Anfield, in a diverse housing stock of Victorian terraces, some humble, some grand: five bedroom redbricks with period features. These are the houses Phil and Kirsty dream of except for their ‘location, location, location’. Because in Anfield residents have been told their location is one of deprivation, undesirable, and their houses not good enough. Conversely, as Jayne Lawless explained when our minibus parked outside what was once her family home, “we didn’t feel deprived”. Here stood the now ‘tinned up’ terrace in which Jayne’s parents raised their family, both worked and Jayne had a comfortable home in a safe and caring community. When they were just five years away from paying off their mortgage, Jayne’s parents were forced to sell through compulsory purchase order. They didn’t get a fair price and, for their new home, they had to take on more debt which Jayne will be liable for when they pass away. As did Bob, who climbed on board our minibus outside what was once his home. A DIY enthusiast, he’d invested in his house over many years, only to watch the damp creep in when surrounding properties fell empty and the council failed to make them watertight. Hospitalised with pneumonia, kids setting fire to empty houses on his street, he was finally delighted with his relocation. He chose not to dwell on the money he lost in the transaction and the fresh debt he’ll pass on to his offspring. On and on the tour went, with one resident’s story layered upon another until finally we were asked inside Sue’s house. Bought by her grandma in 1920, she described the ways in which her family had modernised and in turn restored this beautifully presented home. A compulsory purchase order has hung over it for years and Sue still doesn’t know if she is staying or going. She hangs on as her surroundings fall into the ‘controlled decline’ of absentee private landlords, antisocial tenants and neglected empty houses from which flora grow through into the walls of Sue’s loft space. Sue was barely able to conceal the emotional pain and burden of stress this has weighed upon her for no small number of years. Jeanne van Heeswijk has been working with the community in Anfield for the last two and a half years. Through the 2Up 2Down / Homebaked project the community can take matters into their own hands. Here the community have come together to reuse a block of empty property made up of a former bakery building and two adjoining terraced houses. They have set up the Homebaked Community Land Trust, a cooperative organisation with its roots in the garden city movement. This will enable the collective community ownership of the properties and the reopening of the Bakery as a social enterprise. Visit the Homebaked blog to see what they’re up to. 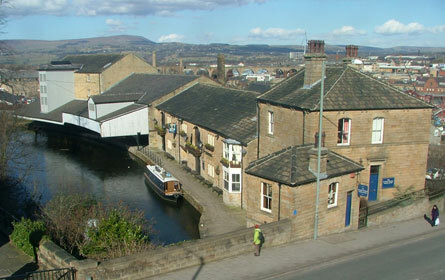 Find out more about ground-UP and the South West Burnley Museum. Stuart Marshall from Treasure Trails takes us through the second part of his journey in creating the Weavers’ Triangle app…. The route of the trail came easily. I wanted to take the participant on a journey through time and so the Weavers’ Triangle Visitor Centre was an ideal and easily located starting point. Sandygate Square forms a focal point of the area’s regeneration and has been the location of recent events and performances. This was a logical end point to bring the story up-to-date and look into the future. 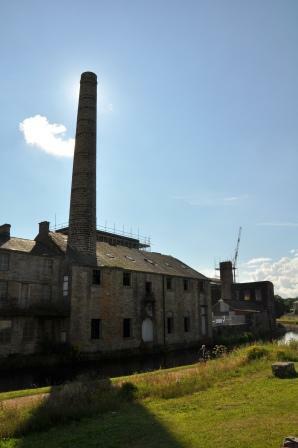 Between these two points the canal and Trafalgar Street offered opportunities to tell the story of the canal, mills and the people who worked in them. Once I’d worked out the route and identified the key locations along it, I could then source the archive material to create image slideshows, videos and sound bites which would play when the user reached points of interest along the route. The internet has put information at our fingertips but there really is no better way of spending an afternoon than exploring what our local libraries have to offer. Burnley Library was a fantastic resource and an essential source of the many archive images I used within the app. To create part of the audio soundtrack I recorded local dialect poet Mervyn Hadfield reciting some of his stories. Five minutes of recording were followed by a most enjoyable couple of hours reminiscing about our respective childhoods growing up among the cobbled terraced streets of Burnley and Rochdale and our parents’ working lives in the cotton mills. Common experiences separated by thirty years, but a world that has now largely disappeared. A trip to the North West Sound Archive at Clitheroe Museum (where reel-to-reel tapes and C60 cassettes still exist!) filled the gaps with oral histories of mill workers and bargemen, which they were happy to exchange for my recordings of Mervyn’s memories. It has been interesting to see how people have reacted differently to the various forms of media. Contrasting how a location looks now, compared with archive images showing the same place in the past, always seems to delight the user. My own favourite is a hole in the wall alongside the canal. If you look through it in the real world a patch of derelict scrubland is revealed. Looking through the hole using the app reveals something completely different, a journey back in time to what was there before and how it sounded. You’ll have to find out for yourself what that was though! Without wanting to sound too deep and analytical, the project does feel like a coming together of many strands of my life – my family’s connections to the cotton industry; the History degree I thought I’d never use directly; a career of over twenty years in software development; more recent experience as a trail writer; and reacquainting myself with a town I’d not really visited since my dad used to take me to the Turf in the days when Burnley actually had a good football team. If this was a reality TV program I’d probably say that I’d been “on a personal journey”. So the app is now out there, available on the iStore and Android markets. A lifetime’s ambition has been accomplished. Published, at last! Treasure Trails devise Trails that inform, entertain and educate people in inspiring ways. Our Trails capture the imagination, often using game thinking and game mechanics to engage users with their environment. We now develop location-aware apps for smart phones which provide exciting opportunities to create media-rich trails, guides, stories – and of course puzzles, games and treasure hunts – using a mix of audio, video, text and images to immerse the visitor in their location. Our company has produced outstanding tailor made Trails for major organisations such as the BBC, National Trust, the Woodland Trust, and many more. Stuart Marshall from Treasure Trails takes us through the first part of his personal journey…. It started with a Tweet. I can’t remember exactly what I was tweeting about but it elicited an immediate response from @teamMPA. “Intrigued! I think we should talk”. Within the week I was at Mid Pennine Arts’ offices in Burnley meeting with Business Director Rob Carder to explain all about our interactive trails and to discuss ways in which we might possibly work together. It soon became apparent to both of us that there was an obvious synergy between MPA’s ‘Art + People + Places’ formula and Treasure Trails’ aim of connecting people with the local environment, ‘The Fun Way to Explore’. It was when Treasure Trails began to develop location-aware apps for smart phones that the real opportunities became more apparent. Now the trails could not only be used to link works of art but themselves become a new medium for their interpretation – using audio, video and images, all triggered by GPS – to engage, inform and enhance the visitor experience in a way that could not easily be achieved with more traditional paper-based trails. 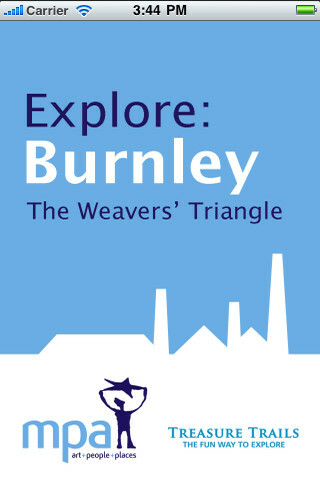 We decided that the Weavers’ Triangle area in Burnley should be the subject of our first joint collaboration. 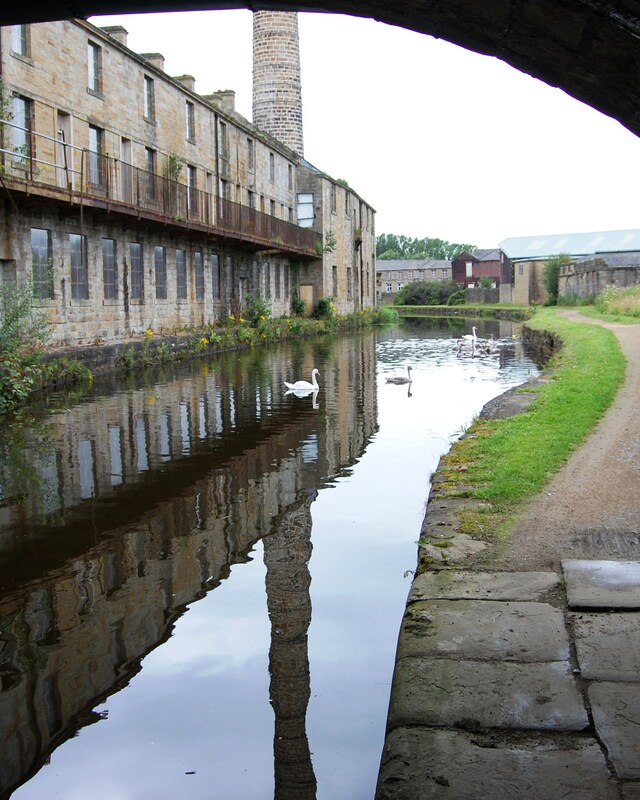 This area, once at the heart of Burnley’s textile industry, has been the focus of regeneration plans by Burnley Council for some time and MPA have been actively involved in this process. One of their recent projects, Project Pride Burnley, had brought the area to life with a piece of promenade theatre within the old mills. The outcomes from this project would be used as the basis for the app. Soon a steady flow of information arrived electronically and through my letterbox. A documentary of Project Pride, videos of Dark Satanics and a plethora of images. Stories of Sandygate, a recent creative writing project that captured local peoples’ memories and stories of the area was also included. I followed this up with research into the history of the area via the internet and visits to the site. I always knew a History degree would come in useful one day! Watch out next week for the second part of this fantastic account of Stuart’s journey to producing the Weavers Triangle app. If yo u can’t wait for the second part of this instalment to view the app, you can download it now for FREE from Android or itunes .